Chase Utley is back in town. The Phillies are in first place, and Chase Utley will be playing at Citizens Bank Park. What year is this? The Phillies played two Sunday and rallied in the doubleheader finale to finish the day with a one-game lead over the Braves. Rhys Hoskins homered, and Vince Velasquez was excellent. Now, Utley, Manny Machado — remember him? — and the Dodgers come to South Philly for a three-game series. It's a big one. Chase Utley spraying champagne after the Phillies won the World Series on Oct. 29, 2008. How will Utley be cheered after the greeting? Chase Utley received a curtain call two years ago after he hit a grand slam during his first visit to Philly with the Dodgers. He was greeted last September with a standing ovation after hitting a pinch-hit triple before scoring the tying run. Both of those hits hurt the Phillies, but those were different Phillies teams. What happens this week if Utley delivers a key hit for the Dodgers against the first-place Phillies? The Phillies were seven games under .500 when the fans at Citizens Bank Park forced Utley to leave the dugout in 2016 and tip his helmet. The Phils had just 10 games left in a 96-loss season last year when they cheered Utley's big triple. Those nights were about Utley, not the Phillies. The cheers felt fitting. But the Phils enter Monday night's series opener in first place this late in a season for the first time in seven years. The Dodgers, with the addition of Machado, are the favorites to win the pennant. This is a big three-game series. And an Utley hit could not only change a game but it could also sway the Phillies' playoff chances. Can that get cheered? 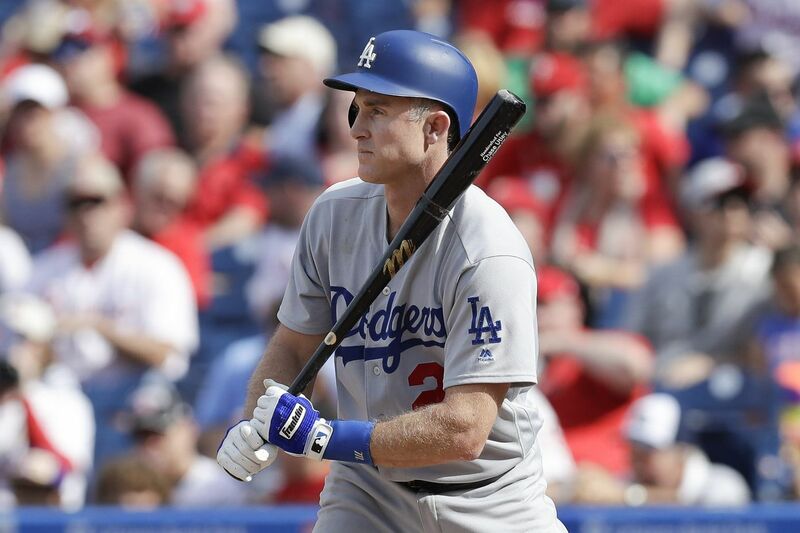 It will be an emotional series as Utley makes his last regular-season visit to Philly. His first at-bat will no doubt begin with a long-standing ovation. It's always a nice moment. But if he then strikes a home run or another game-changing hit, what happens? Do the cheers suddenly stop? The crowd could be conflicted. It'll be interesting to see what happens if Utley comes through again. Aaron Altherr and Mark Leiter Jr. were both sent to triple A after Sunday's doubleheader. The Phillies had to clear one spot for Zach Eflin, who will be activated from the disabled list before starting Monday. The other spot will likely be filled by a relief pitcher, and Altherr's demotion will leave the Phillies with a four-man bench, which is what they played with during the first half. It sounds as if the Chase Utley who plays for the Dodgers is the same guy who played for the Phillies. Scott Lauber talked to Dodgers closer Kenley Jansen, who reveres Utley for many of the same reasons he was beloved here. Utley is the last player to leave the ballpark, spends hours in the video room, and even points out to the pitchers if he thinks they're tipping their pitches. Not much has changed. General manager Matt Klentak said before Friday's game that the Phillies expect to be active before the trade deadline on July 31. That activity will likely be to acquire a relief pitcher and a bat as Klentak said the team would prefer to stay out of the market for starting pitchers. Starting pitching continued to carry the Phillies on Sunday as Vince Velasquez pitched seven shutout innings before Rhys Hoskins hit a three-run homer to make the game feel a bit more comfortable. Velasquez did not allow a hit until the sixth inning, and it was his longest start since last July. The reason for the pitching staff's success? An increase in strikeouts, Mike Sielski writes. The Phillies staff has the sixth-highest strikeout rate in baseball and a handful of relievers who average nearly double-digit strikeouts per nine innings. Tonight: Zach Eflin opens the Dodgers series, 7:05 p.m. Tomorrow: Aaron Nola makes his first start of the second half, 7:05 p.m.
Wednesday: Chase Utley plays at Citizens Bank Park for perhaps the final time, 12:35 p.m.
Thursday: Phillies open a four-game series at the Reds, 7:10 p.m.
Jayson Werth (left) and Chase Utley on the field after a Phillies game in September 2009. Pat Neshek logged another scoreless inning Sunday, handling the eighth inning of the 5-0 win over the Padres. It was Neshek's 51st career appearance with the Phillies, and 49 of those 51 have been scoreless. He has yet to allow run at Citizens Bank Park in 25 innings, as both of his run-scoring appearances have come on the road. If the Phillies stay in the race, Neshek will play a key role down the stretch. Answer: The first credit for success always has to go to the players, as they are the ones directly responsible for it. The Phillies have the youngest roster in baseball, and a lot of players have taken big strides this season. But it would be foolish to not then credit Gabe Kapler and his coaching staff for the Phillies' turnaround. Kapler brought a positive vibe and seemed to inject the clubhouse with confidence ever since being hired. The coaches use analytics to bring a detailed, in-depth strategy to every game, and then that information is used during the game to make almost every decision from defensive shifts to pinch hitters to what pitches to throw to a certain hitter. The coaching staff is a huge reason the Phillies are where they are, especially pitching coach Rick Kranitz and assistant pitching coach Chris Young. The pitching staff has the highest WAR in the National League, just a year after finishing around the league average. That doesn't happen by chance.